Okay so more like 1500….but even that was a challenge! After a scenic walk from the hotel, (thanks Richard) I could hear the reception before we actually were in the reception. Immediately Mike Tholfsen, (Program Manager for OneNote and Avenger) enthusiastically introduces himself personally as well as to Chris Pratley, (CREATOR of ONENOTE and SWAY!) and so began a surreal evening of meeting the actual persons connected to the products, voices, the tweets, the blogs, the Facebook posts that I have followed the past 7 months. It is here that I met some of Team 23, Jen, Philippines, Kausik, India, Graciana, Argentina and Olga, Albania. My heart was full as I looked around and saw people from all over the world, enthusiastically interacting. This was going to be a great week. One word for breakfast…BACON. Then led by a High School Marching Band (WHAT!!?) we entered The Mixer where we were greeted by the Drum Café and enjoyed a group drum rectangle with 300 of our closest new friends. After being challenged with a dynamic keynote by Anthony Salcito, VP Microsoft Worldwide Education, to be “Brave, Courageous and Leaders”, the room is so charged with energy we could have lit up Seattle! We head to our stations to present our Teach Meet Projects in Building 92. It was overwhelming to see such a variety and depth of projects and the only thing lacking was time to spend with each person. It was here that I met Ari Schorr, Product Marketing Manager for One Note as well as Toni Townes-Whitley, Worldwide Public Sector VP at Microsoft. (These people are serious about education! )This was followed by our regional sessions where we joined, Canada, Australia, New Zealand and Japan for the presentation. Next on the agenda was grabbing a cookie and connecting with Team 23 to hear about our Global Challenge which would be presented on Friday. Josh Sawyer and Mette Haute challenged us with their presentation and we began the work of 7 unique personalities from 7 unique countries coming together to create a “Learning Activity and Pitch”. We brainstormed for roughly an hour, overcoming language challenges with Bing Translate and a wonderful assistant! After sharing difficulties students encountered receiving an education in different countries, we had a focus and began to delegate the work and TIME WAS UP. More BACON and breakfast with the USA E2 Crew then back to the Mixer. Our keynote speaker was Ziauddin Yousafzai, father of Malala, She is known mainly for human rights advocacy for education and for women in her native northwest Pakistan, where the local Taliban had at times banned girls from attending school. His message touched my heart deeply and I struggled with tears listening to the bravery and sacrifice of his family as I tested my own weaknesses. Such a privilege to have heard this man and his story. This will remain in the forefront of my E2 memories. 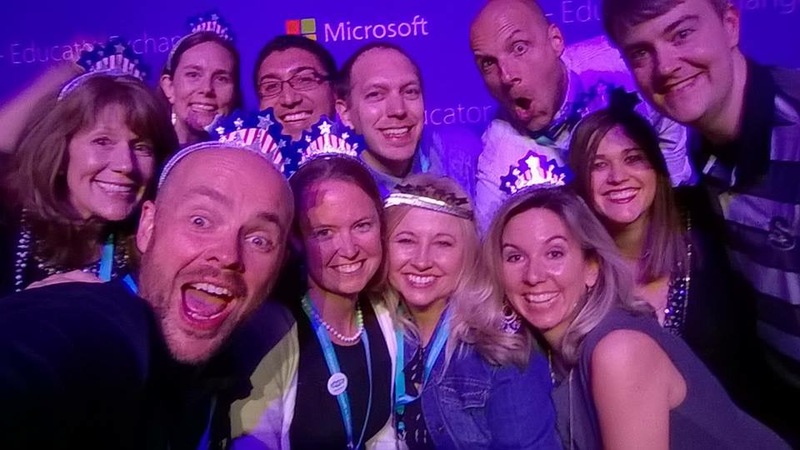 Our next event was the educator led trainings, Josh Sawyer, Kevin Sait, Tammy Dunbar, Marija Petrska, Darcy Grimes and Stacey Ryan shared OneNote, Sway and Skype in the Classroom presentations and rocked it! So many great tips and examples and the passion was contagious. Time for a quick lunch and then two hours to work with Team 23. One thing I have to say (and Aaron Mauer said it best in his blog post), Collaboration is HARD. It is hard work to let go of control, to balance the load, to include everyone and be respectful of ideas and thoughts that might not line up with your own! We ALL had great ideas, we ALL could have created a presentation, we ALL could have been the main speaker. But in the end, it was a beautiful thing, a true collaboration, an experience that I fell in love with, just as I loved my team members. JEN PADERNAL – De La Salle Dasmarinas, Philippines, OLGA ILCHENKO – School 548, Russia, LINDA FOULKES, NetLearn Update, South Africa, KAUSIK GHOSH – Vidyasagar University, India, GRACIANA MABEL GOICOECHANDIA – Escuela Bilingüe Dante Alighieri, Argentina, Argentina and MIRJETA DOMI – 28 Nëntori Secondary School, Albania. My new brother and sisters. You guessed it, BACON and off to the keynote. One of my favorites. Angela Maiers! (I covet her arms) She shared her heart on Genius Hour and her Choose2Matter focus. A passionate communicator, Author and teacher her energetic message was hard not to catch. Looking forward to seeing her in the Fall at our own GaETC Conference in Georgia! It was a good message to hear before we began our Global Educator Challenge presentations. Gathering Team 23, we retreated to an empty room and ran through our presentation, tweaking a few things and enjoyed the time together. Our presentation Student Hands of Hope…A World of Solutions was shared by each team member with conviction of their belief. I stood with pride knowing we had come together, each so different but bound together by our love for students. Before we could blink the presentation was over, we answered a few judges’ questions and out we went. While in the end we did not win the formal challenge, we were all winners and better people because of the experience. The next part of the day turned surreal as we again entered The Mixer for a “fireside chat” with a Microsoft executive, who was none other than the CEO, Satya Nadella! Everyone went wild, when he was introduced and listened intently as he shared his heart for education and Microsoft goals. He opened up the floor for questions and again I was touched by diversity sitting in the room and the thoughtfulness of their inquiry. The next part was magical. I, Sandi Adams and 7 other MIEE from around the world, 2 Fellows and 3 students were whisked away to a magic wall which opened into the coolest James Bond living room for a private personal conversation with Satya Nadella. (WHAT?!) Also in attendance were Anthony Salcito and Toni Townes-Whitley. Was this my real life? 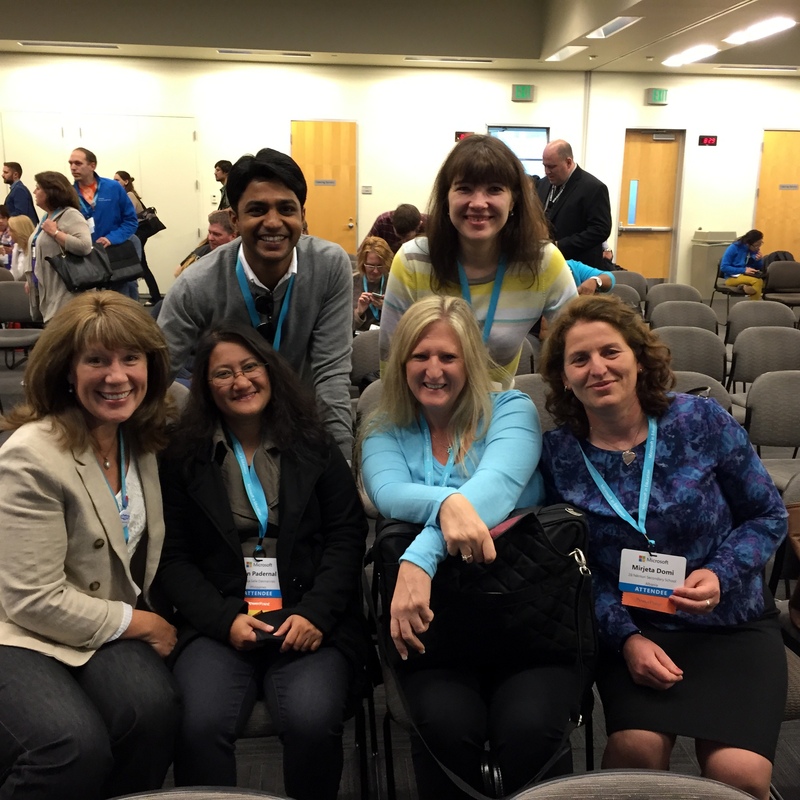 We were warmly greeted by Satya and encouraged to share our thoughts on the MIE program, Microsoft in Education and offer any ideas. Each of us took turns sharing our thoughts and ideas and all too soon, it was over! What an honor and incredible experience. Truly as my husband said, the icing on the cake. A quick tour of the campus as I was shuttled by Christina and off to a tour of the Surface Development Labs and then to the hotel with thirty minutes to get ready for the GALA!! Again, we load the buses and head to downtown Seattle, one of my favorite cities on a beautiful evening. The Gala was held at the EMP Museum. The area had a cirque du soleil feel which contributed to the great celebration. Awards were given to the winning teams and we cheered each group as they took the stage. Special shout out to my E2 USA Crew winners, the unsinkable and talented Tammy Dunbar, the amazing and calm, Kristen Messer, the beautiful and witty, Holly Dornak and the big winner, the sweet and humble, Dianne Krause. The night ended far too soon with goodbyes to our new friends from around the world. It was with a tinge of sadness that I climbed off the bus and headed to my room. However with the magic we call technology, there is no doubt these relationships will stand for many years. Before I end my epic novel about the week experience, I have to say a global thank you to Microsoft for recognizing the hard work that goes in to educating and loving on the world, a more local thank you to my new friends and Team USA and a special thanks to Robyn Hrivnatz for her encouragement and confidence in us all. This entry was posted in MIEE15 and tagged Microsoft, mieexpert15, MSFTEduE2, onenote, sway by sandiadams. Bookmark the permalink.